On Sunday, he promised to follow through on tax cuts and pro-business, tough-on-crime policies that include registering the DNA of any suspect arrested for an imprisonable crime. Like U.S. President-elect Barack Obama, Key is 47 and suffered from attacks on his inexperience during his fast rise to power. And like Obama, Key won the election campaigning on the theme of CHANGE (New Zealanders can believe in? :-)). Both men are members of minority groups and children of foreign-born parents (Obama’s father was a Kenyan). And Key even owns a home in Hawaii, where Obama was born. Key does not practice Judaism but is involved in New Zealand’s Jewish community, which numbers around 7,000. He participated in the celebrations of Israel’s 60th anniversary and has donated to the Hadassah University Hospital in Jerusalem. He also has cousins in Israel, though he hasn’t visited the country yet. My father died when I was a young child. I do not remember him. I was raised, along with my sisters, by my mother, in a state house in Christchurch. Back then I thought I was poor and, by most standards, we were. As I grew up, though, I recognized that what my mother gave to my sisters and I was far more valuable than money. She instilled in us the desire to improve ourselves by our own hard work, the confidence that we were able to do it, and the hope that it was possible to do so. She instilled in me an ethic of hard work and determination and a genuine belief that “you get out of life what you put into it”. The State gave me the education that allowed it to happen. Those fundamental characteristics that were instilled in me–and the opportunity that was given to me, which I seized–I believe readily translate to New Zealand society as a whole. Hope (on the right) in New Zealand! Hope (on the left) in America! Long live hope around the world! 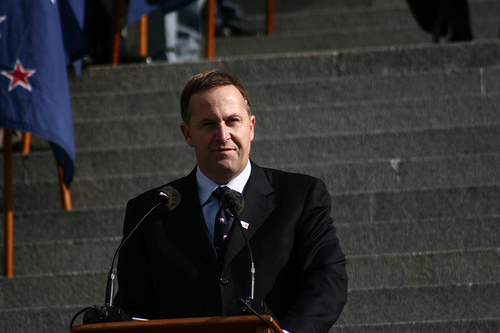 This entry was posted in Politics and tagged Austria, conservative, election, jewish, John Key, Lord of the Rings, National Party, New Zealand, prime minister. Bookmark the permalink.